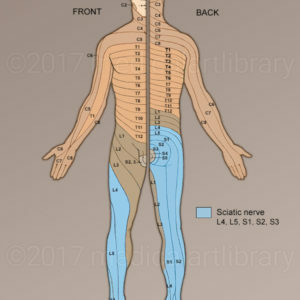 The sciatic nerve is the largest nerve in the body and arises from the L4 through S3 spinal nerves (and their roots). It exits the pelvis through the sciatic notch, and continues down the back of the thigh where it splits into the common fibular and tibial nerve at the knee. The common fibular and tibial nerves and their branches continue downward to innervate the lower leg and foot. Sciatica refers to the symptoms of pain, numbness, tingling, burning sensation or weakness that originate in the lower back, radiate through the buttock, and continue down the back of the thigh, leg and foot. Sciatica occurs when there is compression, inflammation or injury to the sciatic nerve or to its (spinal nerve) roots. This type of pain that radiates along the course of a particular nerve root is called radicular pain. Depending on which nerve root is affected, different areas of the leg may exhibit symptoms. The most common cause of sciatica is impingement or compression of a nerve root by a herniated disc. A lumbar disc can bulge or herniate causing narrowing of the spinal canal or intervertebral foramen, the hole through which the spinal nerve exits the vertebral column. Likewise, osteoarthritis can cause overgrowth of bone which narrows the spinal canal or foramen. 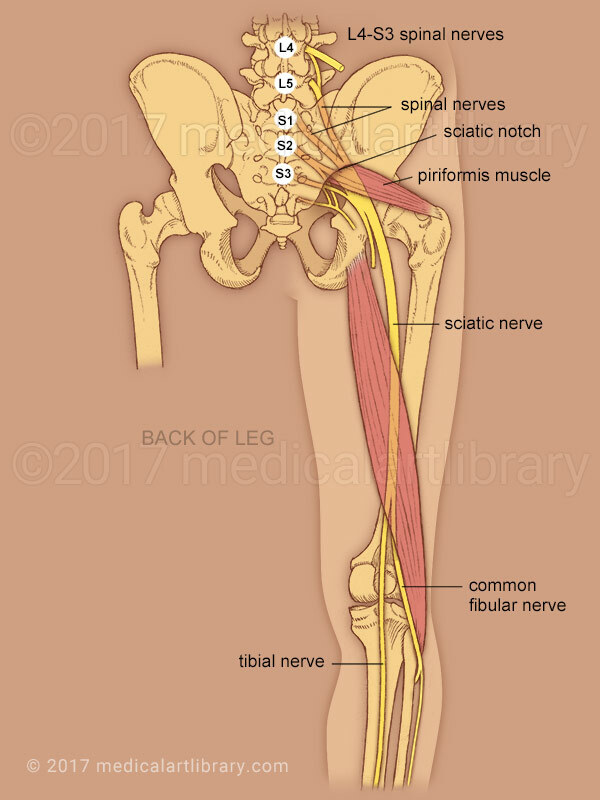 Additionally the sciatic nerve may be compressed by the piriformis muscle as it exits the pelvis. This is typically described as a dull ache in the buttock that may radiate down the back of the thigh.